For you Redskins football fans there is hope and belief that your team’s quarterback Robert Griffin III (RG3) will be ready to open the 2013 season. His reconstructive knee surgery was deemed a success. Football fans are well aware that Griffin had ligament injuries – a weakened and then torn LCL and ACL. The ACL was previously replaced in a separate reconstructive surgery in 2009. The plan is for “RG3” to focus on his quadricep strength as a future preventive measure to protect his ligaments. You may ask what about PRP or Prolotherapy to help strengthen those ligaments? Well let’s see if PRP (Platelet Rich Plasma Therapy) is not suggested down the line. The torn LCL can be a complicated injury. Typically an injury to the LCL will involve other ligaments as in the case of RG3, the ACL. The LCL holds the outer part of the knee together. It extends from the outside part of the lower leg bone to the thigh bone. As with the ACL it is better not to rupture this ligament. If weakening or laxity is suspected, then treatments to strengthen the ligament should be considered. 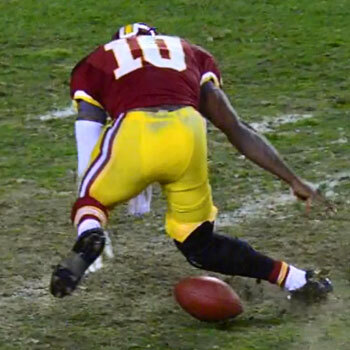 Reconstructive surgery is a difficult surgery and in RG3’s case seems to cause more concern than the ACL injury. Is Non-surgical joint reconstruction possible? Joints weakened when ligaments and tendons are stretched, torn, or fragmented, become hypermobile and painful. Traditional approaches with anti-inflammatory drugs and surgery often fail to restore joint function and relieve pain permanently. Prolotherapy, PRP, and Stem Cell Therapy have the ability to directly address the cause of instability and repair the weakened sites, resulting in permanent stabilization of the joint — all without surgery. These treatments are administered as determined on an individual basis. The length of the treatments is variable and depends on several factors, including nutritional status, ability to heal, and the degree and site of the injury involved. Some patients may experience complete relief from pain along with restoration of full function after only one or two treatments. Generally speaking, however, back and neck problems require from six to twelve sessions and less extensive injuries from one to six sessions. Both Dr. Magaziner and Dr. Greenberg are experienced and skilled in prolotherapy treatments. Dr. Greenberg performs over 4,000 procedures per year, with some of his notable patients being Simon Gagne (left wing for the Philadelphia Flyers), Mark Simoneau (former starting linebacker for the Philadelphia Eagles) and Mike Carey (linebacker for the Oakland Raiders).